A mother who is a cannabis medicine caregiver and a medical marijuana company have filed a complaint against the New Mexico Department of Health. The legal action is based on the state’s medicinal marijuana program apparently causing “direct and immediate harm”. Under New Mexico’s program, the maximum number of plants that can be cultivated by a Licensed Non Profit Producer (LNPP) is currently 450. It appears supply can’t keep up with the demand coming from the nearly 28,000 registered patients in the state. 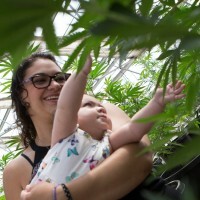 It’s this 450 plant limit, says Nicole Sena and New Mexico Top Organics-Ultra Health Inc, that has led to Ms. Sena being unable to secure supply of the cannabis medicine her daughter needs. Amylea Sena, an infant, suffers from a rare form of epilepsy. According to CEO and President of Ultra Health Duke Rodriguez, the current plant per patient ratio in the state is one half plant, compared to six plants per patient in Colorado. Suitable supply isn’t a new problem in New Mexico. It seems in 2013, a survey revealed forty-six percent of patients claimed they were unable to obtain medical cannabis because producers were out of stock. At that point in time, the number of plants LNPP’s could have was just 150. The litigants accuse the New Mexico Department of Health of mishandling the program, including not processing patient cards in a timely manner as required by law. A recent entry on the NMDOH web site acknowledges the issue, but states the Department is working to address “new, unanticipated demand” in relation to applications – which are currently taking around 42 days to process. New Mexico’s Medical Cannabis Program was created under the Lynn and Erin Compassionate Use Act. Qualified patients are allowed to possess up to approximately 8 ounces of usable cannabis; or their caregivers to transport the same amount. Patients can also apply to grow their own supply of medical cannabis. Under the Personal Production License (PPL), patients are allowed to have 4 mature plants and 12 seedlings at any given time.